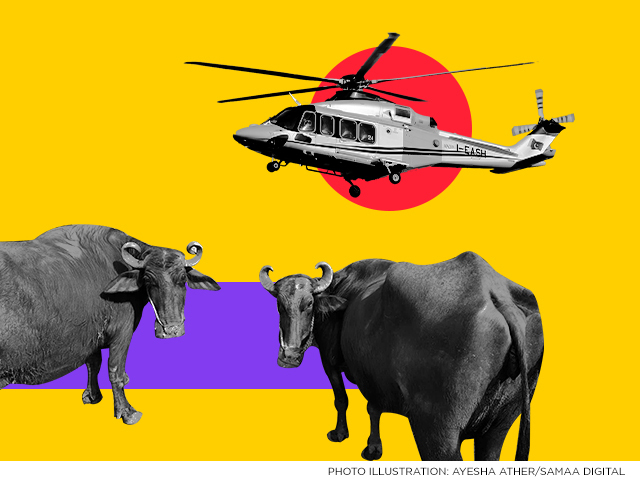 After announcing the auction of luxury vehicles, the government is looking to sell ‘unused’ items including helicopters and buffaloes. The Special Assistant to PM Naeemul Haque tweeted on Monday that the government will sell four helicopters after the auction of the vehicles. He said that former prime minister Nawaz Sharif had kept eight buffaloes at the PM House to meet his “gastronomical needs”. The PM House will auction off 33 cars and one bus from Prime Minister House on the directives of Prime Minister Imran Khan. The auction will be held on September 17. In his first address to the public, the prime minister vowed to practice austerity. New and unnecessary vehicles from PM House will be auctioned off including, eight BMWs, four Mercedes, 16 Toyota Corollas, one Honda, three Suzukis and one bus.